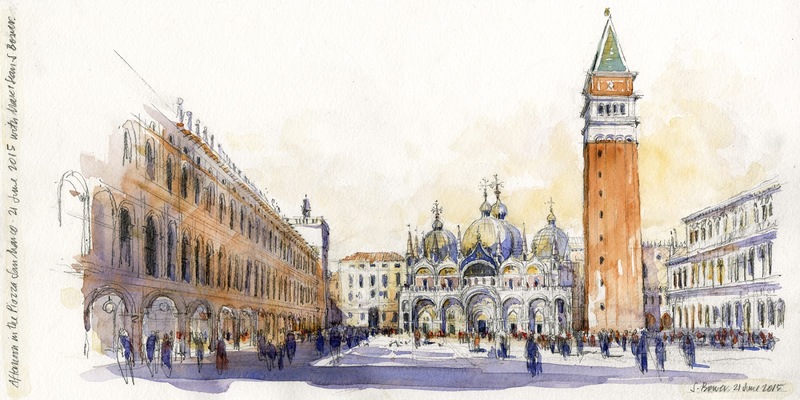 Sketching Tip #8: Towers are like Wedding Cakes! Imagine a wedding cake...if one layer is off-center from the one below it, eventually we'd get a tragic cake collapse and wedding disaster! Same for Towers. I often see towers in sketches that somehow look a little off. The reason: it's layers are not stacked properly in perspective! 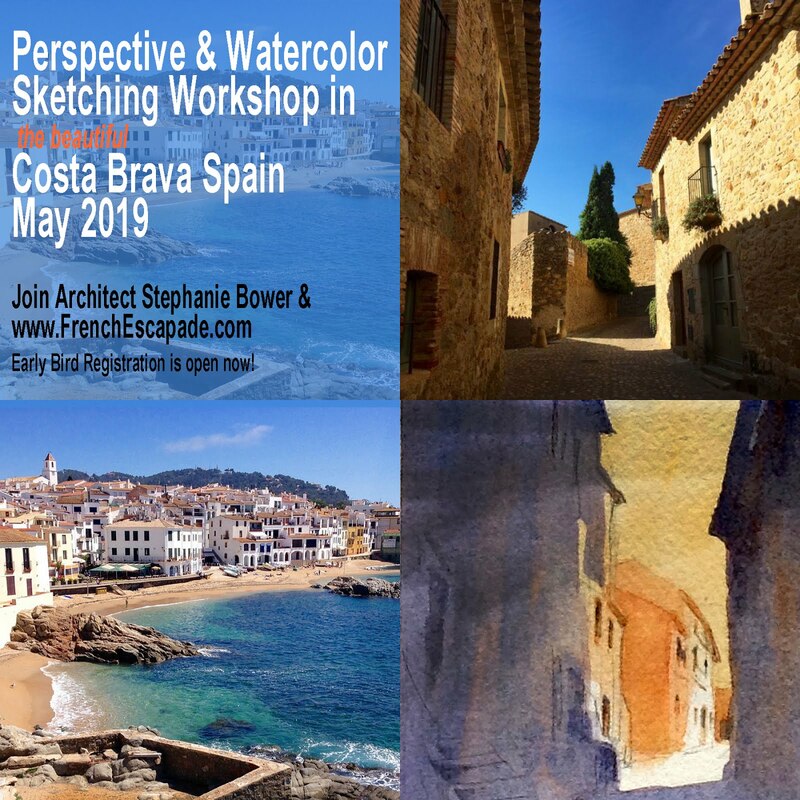 So how to better sketch a tower? I'll show you two ways. Method 1 -- find the center of the tower. As in wedding cakes, it's important to establish where the center of the tower is in order to draw it properly. We do this in perspective by using your skills from middle school geometry class: drawing diagonals. If you think of the forms as transparent, this is much easier. I look at a tower and I think of a stack of 3-d blocks, usually getting smaller/narrower toward the top. I often lightly draw in the entire center line up the arch for reference. 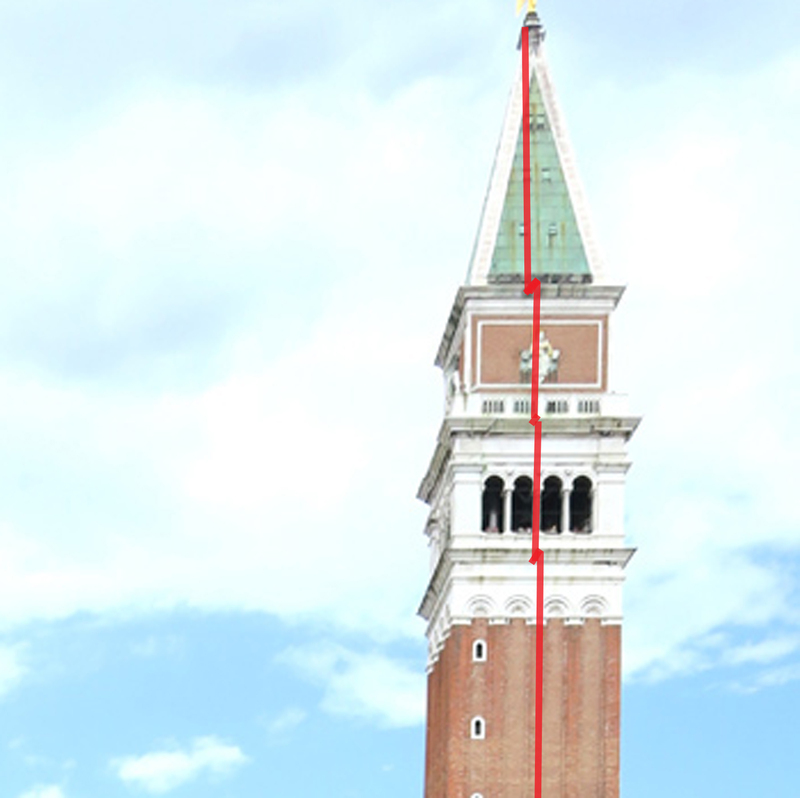 You can be sure whatever detail is at the very top of the tower, it sits on top of your center line! Venice in 2015, sketching what may be one of the most famous towers in the world, the Campanile in the Piazza San Marco. Here I am on the left, sitting in spot of great honor with the incredible Marc Taro Holmes and his friend and mind-boggling illustrator, Sean Andrew Murray. HA! No pressure at all !?!? You can see how I don't just see the face of the sides of the tower, I see it as a stack of 3-dimensional blocks. 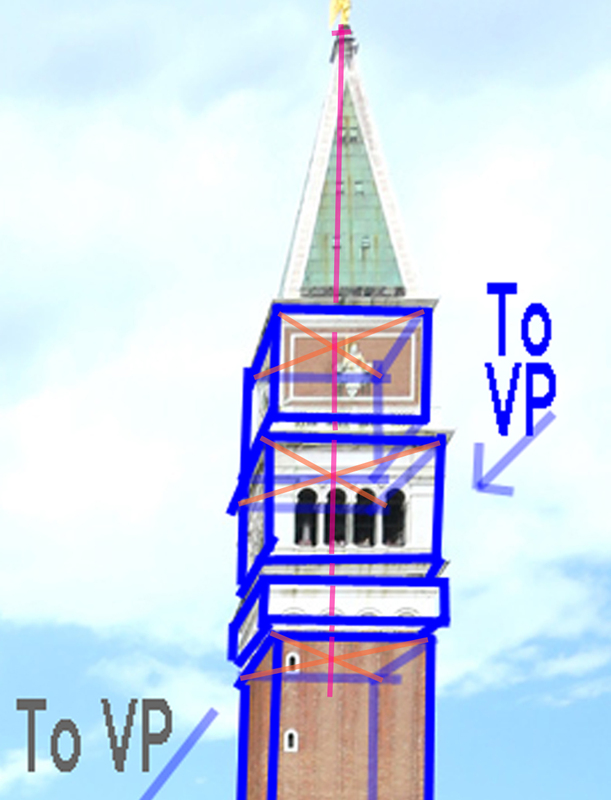 Remember one or both sides of your tower will go to the vanishing point/s on your eye level. 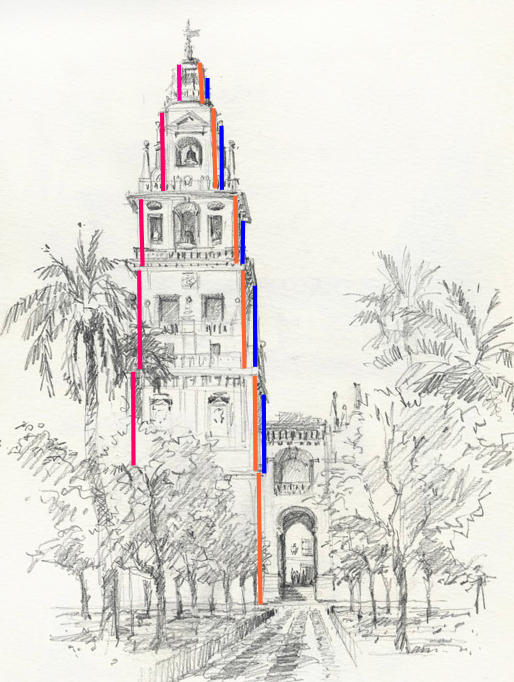 Consider, each face of the tower steps inward toward the center from one layer to the next. 1 -- Start with the blocks, as above. 2 -- Use diagonals to find the center of each block. 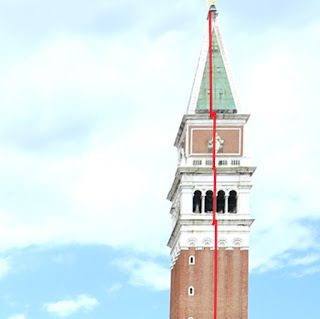 3 -- draw in your center line all the way to the top of the tower. 4 -- Here, once I find the top of the center line, I can just connect it to the corners to get the pyramid shape at the top. This is easier because the faces of the pyramid are sloped. 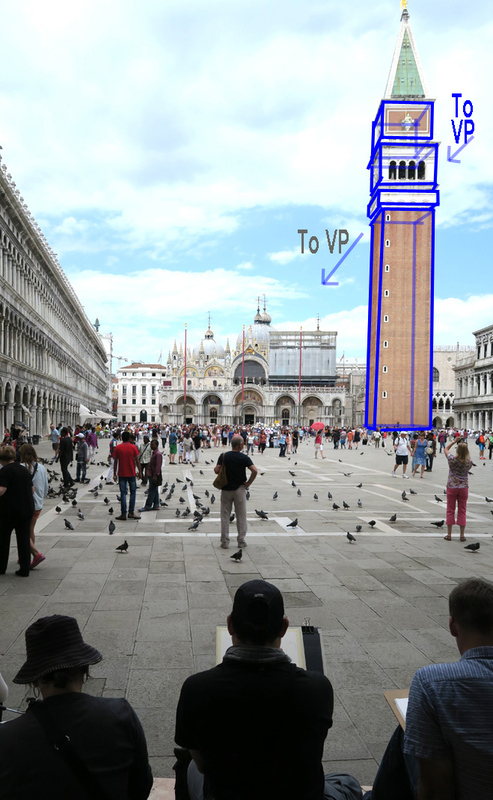 I don't always draw every level like this, but it's important to understand this concept when you sketch a tower. In reality, I probably use a combination of methods 1 and 2. This way is definitely easier... I look at the edges and where they are relative to each other. Examine how much each is set in from the level below it. 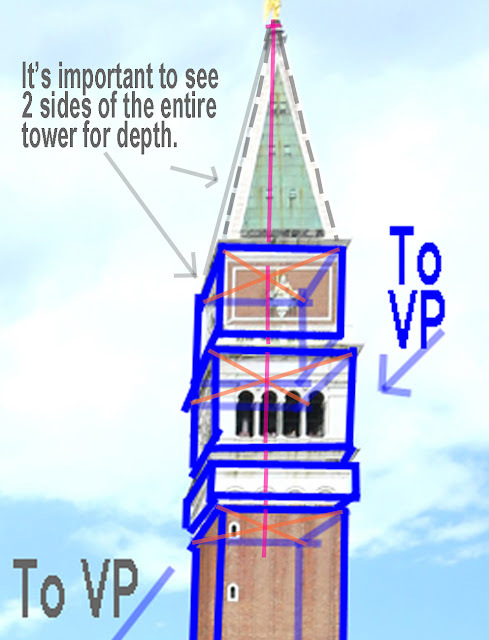 And at the end, I look at where the top of the tower is relative to the layers below, just to check I've got it right. towers, although be careful you don't pull the layers off center! 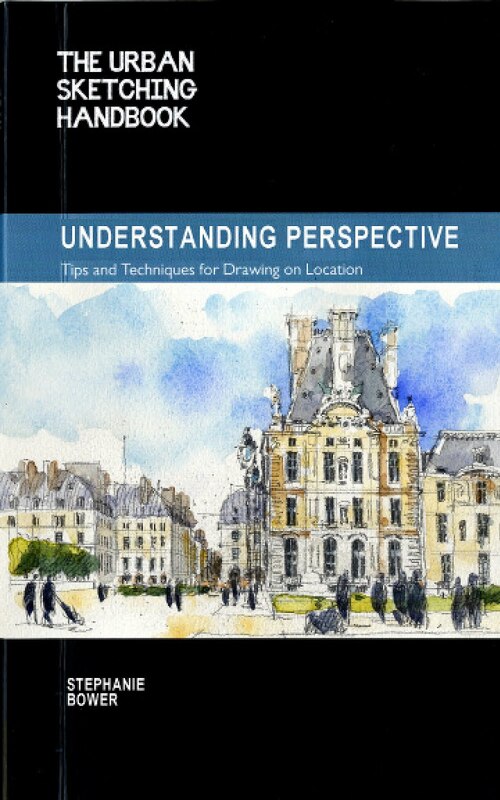 Hopefully, one or both of these methods will help you see towers a little differently, and draw them better!